Make the roasted rhubarb first, carefully draining off the juices before you let it cool. Heat oven to 200C/fan 180C/gas 6. 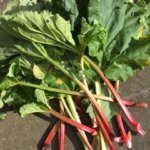 Rinse 400g rhubarb and shake off excess water. Trim the ends, then cut into small finger-size pieces. Put in a shallow dish or a baking tray, tip over 50g caster sugar, toss together, then shuffle rhubarb so it’s in a single layer. Cover with foil and roast for 15 mins. Remove foil. Give everything a little shake, roast for 5 mins more or until tender and the juices are syrupy. Butter and line a 23cm loose-bottomed or springform cake tin. Heat oven to 180C/fan 160C/gas 4. Reserve 3 tbsp of the custard in a bowl. Beat the rest of the custard together with the butter, flour, baking powder, eggs, vanilla and sugar until creamy and smooth. Spoon one-third of the mix into the tin, add some of the rhubarb, then dot with one-third more cake mix and spread it out as well as you can. 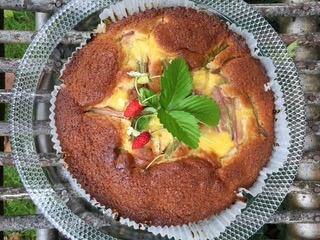 Top with some more rhubarb, then spoon over the remaining cake mix. 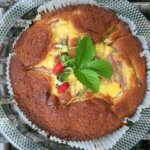 Scatter the rest of the rhubarb over the batter, then dot the remaining custard over. Bake for 40 mins until risen and golden, then cover with foil and bake for 15-20 mins more. It’s ready when a skewer inserted into the middle comes out clean. Cool in the tin.